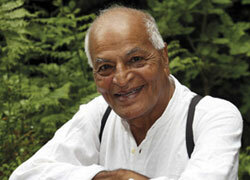 On 13 June 2013 at the Sallis Benney Theatre in Brighton, environmentalist and humanitarian Satish Kumar discussed his ecophilosophy based on the trinity of soil, soul and society. This new trinity offers a holistic, inclusive, and planet-centred alternative to our current worldview, and inspires us to understand that we are, in truth, “members of one Earth community”. The evening included excerpts from ‘Earth Pilgrims,’ a film that asks the question: “From a world swamped in problems, in a global civilization on its last march towards the edge of the cliff, how can we reconnect with a deeper, more meaningful way of life? How can we make a difference?” You can view the trailer and learn more about the film at the Earth Pilgrims website. The evening ended with a short description of the work of The Resurgence Trust by Sharon Garfinkel. Satish explains his philosophy further in The Ecologist and in his 2012 talk for TEDxExeter. Since 1973 he has been editor-in-chief at Resurgence & Ecologist magazine, and his books includeNo Destination, You Are Therefore I Am, Spiritual Compass, and Earth Pilgrim. Satish has regularly contributed to Radio 4’s Thought for the Day and has appeared as a guest on Desert Island Discs. He featured in BBC2’s Natural World Series — Earth Pilgrim: A Spiritual Journey into the Landscape of Dartmoor. Satish is a Vice President at the RSPCA.